Kids love to discover that there's no such thing as "green onions," separate and distinct from the big, bulbous yellow and white onions that we all know. All "green onions," or "garden onions," really are, are YOUNG onions! If you harvest an onion plant before the bulb really starts to grow, that's what we call a "green onion," and you mostly eat the green part. If you let the bulb grow all summer, then the green part is too bitter to eat, but the bulbs are delicious! 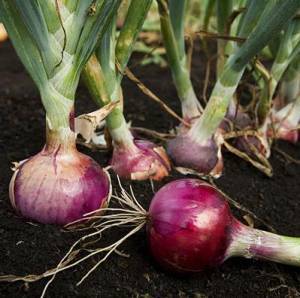 You do grow onions differently based on whether you want to end up with the skinnier green onion, or to let them grow all summer long for a big bulb onion crop that will last you through the winter when properly stored. Green onions are prized for the mild taste of their "greens," particularly for salads, while bulb onions are prized for many recipes as well as the easy way they store for months and months of enjoyment long after the harvest is over. They come in different colors and with different intensities of flavor. You'll probably want to wind up with a few different kinds of onions, to celebrate that variety. There's just a little to know to grow onions right. Spacing is much different for a green onion result than for a bulb onion result, for example. Kid gardeners need to know how to grow onions if they are going to have a very popular theme garden - the salad garden! Luckily, all the "dirt" on onions is provided for you from this Omaha-area grower. They ship almost everywhere and really know onions, as well as sweet potatoes and gardening in general. Here's guidance for what variety will grow best in your area, in the space you have available. With this background information, growing onions should make you LAUGH, not CRY!! !